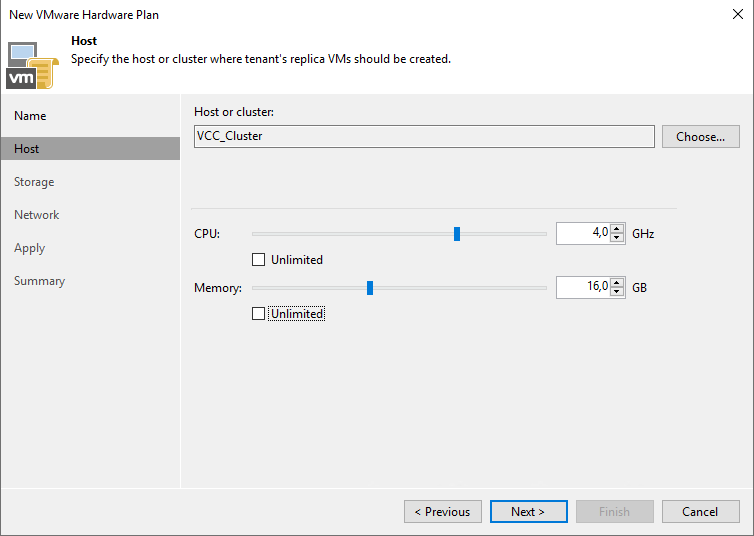 Parameters of backup resources are defined directly in the tenant options, however, for replica resources for vSphere Veeam Cloud Connect uses a different solution. In vCloud Director hardware plans are not needed, instead the limits of a vCloud Organization vDC are used. Hardware plans can be compared to mobile phone plans: each plan is defined with a series of options, and each customer/tenant subscribed to a given plan will receive that amount of resources. Every time a hardware plan is modified, each and every tenant subscribed to the same hardware plan will be affected. Even if hardware plans can be assigned to multiple tenants, we suggest service providers to create dedicated hardware plans for each tenant; in this way, whenever a single tenant requests a change in his hardware plan, the change can be applied to his dedicated plan and no other customer is affected. Network — specified number of networks to which tenant&apos;s VM replicas can connect. 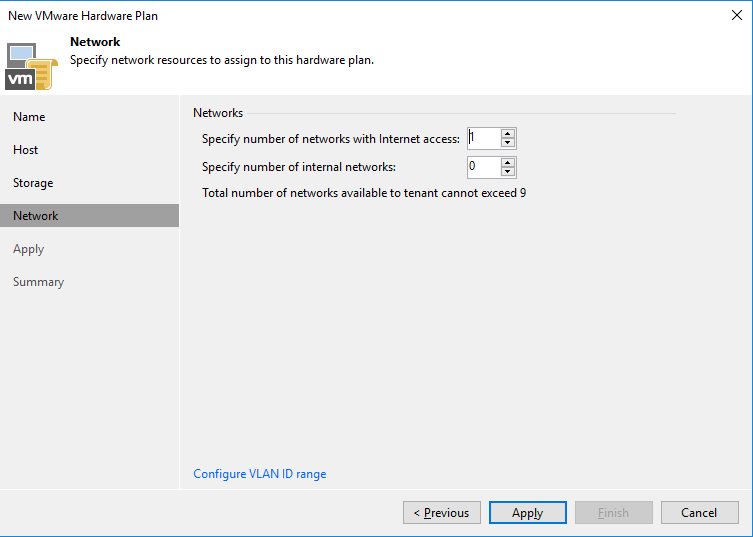 When the service provider subscribes a tenant to a hardware plan, Veeam Backup & Replication creates the corresponding number of network adapters (vNICs) on the network extension appliance that is deployed on the service provider side. We suggest service providers to choose and adhere to a naming policy for their hardware plans: once the number of tenants become significant, it could be problematic to figure out which hardware plan is assigned to which tenant. 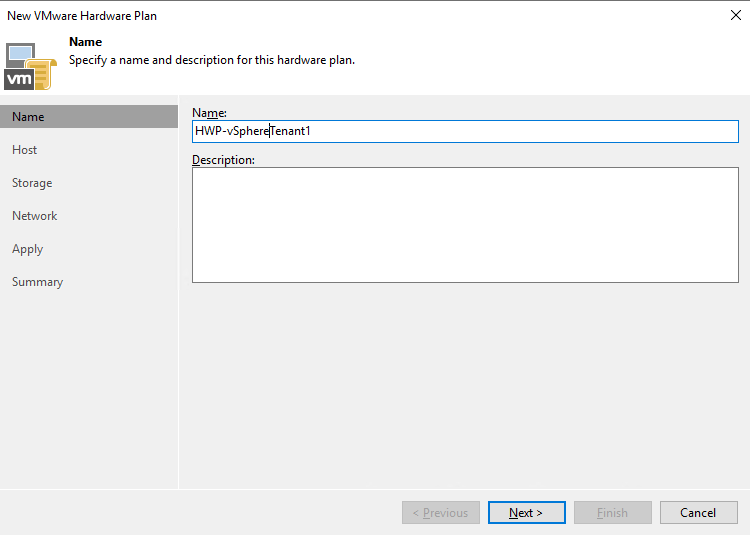 By using a dedicated naming policy (in our example is HWP-tenant_account_name) it can be easier to filter hardware plans and identify the needed one. The resource pool clearly shows the limits for CPU and Memory that were configured during the creation of the Hardware Plan (10 Ghz and 12 GB). Note that, since a Hardware Plan is identified by a resource pool, a Hardware Plan cannot span over multiple clusters. 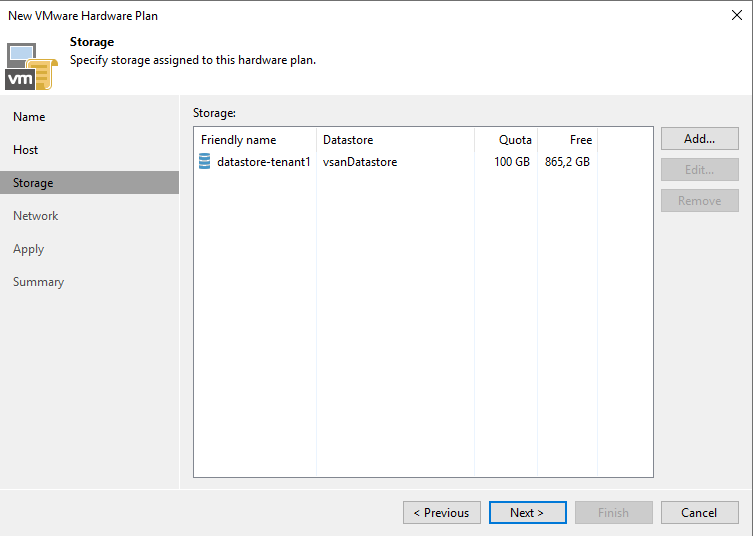 Using a shared datastore that is accessible by all the ESXi hosts, a storage resource is created. Service providers can give it a "Friendly name" to hide the real datastore name, and assign a quota. Quota can be overcommitted, but in this case proper monitoring should be implemented, to guarantee storage is not totally consumed, thus creating issues to the service. Service providers assign one or more networks to a tenant, selecting how many network should be with internet access, and how many should be internal. The difference between the two is the possibility for the tenant to publish services hosted in a failed over virtual machine to the internet, only if the virtual machine is connected to a network with internet access. One single network with internet access is the most simple configuration a service provider can create; more complex designs can be done, closely replicating the environment of a tenant. NOTE: as a virtual machine in vSphere can have a maximum of 10 network interfaces, the maximum number of assigned networks is 9, as 1 interface is reserved for the external interface of the Network Extension Appliance. This interface is not visible to tenants. This limit does not apply to Replication resources using vCloud Director. Once all the parameters have been configured, the Hardware Plan is configured and is ready to be assigned to a tenant.